Kayla comes back to her small town with a terrible secret. Some of the town let her know how much they dislike this and a few others hope she'll come clean with what she knows of that fateful night. Kayla knows if she keeps the secret, maybe her town will accept her again and brush off that night as just a terrible accident. But the burden is almost too much to carry. What worked: I admit, I had a hard time really getting to understand Kayla at the beginning of the novel. The secret she was carrying was vague at first and once I read on, then I started to get a better understanding into the whys behind her decision. Kayla is one of those characters that loves her town, BFFs, and her dream is to be the anchor that holds everything all together. And at the beginning that's exactly what she is. Readers see her love of her town in vivid descriptions and feel her longing for that love to stay forever. After I learned what the secret was? I really felt for Kayla and the difficult decision she had to make in order to be at peace with herself and stop it from happening again. The author nailed the anguish and fear of the town turning on her. Add to all this the guilt eating her up inside. Norah brings some hope to Kayla's life and happiness after so much turmoil. I liked these quiet moments when he tried to reach out to Kayla when others either hold her at arms length or worse. What I had issues with had to be the alternating past and present chapters that really confused me. I had a hard time connecting with Kayla. The way the story is formatted slows the pacing of an otherwise gripping story of a teen facing a difficult decision that could destroy the life she's loved. Also it makes Kayla and her friends come off as selfish when that's not true at all. It would be easy to say that Kayla was selfish too but I 'get' why she did what she did especially when it involves a so-called golden boy of the town. Too often people think that if they don't step forward and report a crime, that it might go away. The intense pressure to look the other way is there. I think Kayla's decision ate at her until the very end. Even then she still carried hatred toward herself on what she didn't do that fateful Spring day. I wanted to give her a hug at the end. A must read for fans of SPEAK, this novel addresses the whole premise of what would you do if you witnessed a friend's sexual assault? Do you look the other way or do you come forward? Or is it more complicated than that? For sure this book will have readers discussing the ramifications of the decisions that come when faced with a similar situation. 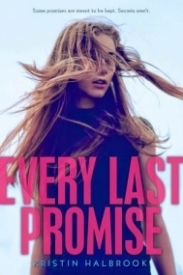 Every Last Promise is an aching story about the young Kayla. She has witnessed something horrible in spring, and now has to live with the consequences in fall. The story is parted into two different stories. One is the story of Kayla in spring, the past. The other one is the story of Kayla in fall, the present. These two different stories are something to get used to, but once you learn to understand that Kayla is different in spring and fall, you will love the book. As a reader you will experience what effect the live changing events have on Kayla. She feels alone and guilty, something Kristin Halbrook knows to describe wonderfully. Her character grows during the story. Kayla is struggling with problems that young adults relate to. The story is build up perfectly. The past is slowly unfolding, while in the present, Kayla is having more and more troubles with covering up her past. The emotions she’s experiencing feel real. The words Kristin uses to describe Kayla’s state of mind make her feel even more real. Personally, I love the fact that the story is taking place in a small town. It has small town problems and small town people talking and gossiping about small town things. The ambience feels all too real. I could almost feel the rain falling down from the sky or feel the burning sun on my skin. I think the way Kristin described the environment was amazing. This is something that makes the story more interesting, more readable and more believable. I do think that the story lacks a little bit of action. Of course, the action happened in the past, but I think that those scenes could’ve been more elaborated. But readers who love a slowly unfolding story, will absolutely love this book. My final verdict? Positive! This book is romantic, sweet, heartbreaking and now and then exciting. The mysterious part of the book leaves you craving for more after every chapter. You will want to read this book until the very last page. Kayla saw something that a party, something she’s kept secret all these months. No one knows the truth behind the night of the accident, no one but her, her friend Bean, and one other person. Kayla spent the summer away but now she’s back for her senior year and it’s not going to be easy to face everyone she left behind. Or their accusing glares. She could speak up, but even if people believe her, she still risks losing everything. This was my first Kristin Halbrook book and it ended up being a pretty fast read. It told was all through Kayla’s POV but in alternating timelines, the present where she was dealing with coming back and the past leading up to the party that changed everything. The different POVs were quite easy to keep track of since Kayla seemed like such a changed person from the weight of the secret she was keeping. I found Kayla to be quite a likeable character, though I liked her more in the present as she was determined to face her peers after spending so much time away after the accident. She came back and everything was different, her group of friends broken, and she wanted answers. In the before parts, their friendship had seemed so strong and I loved that she wanted to find out what happened and hopefully repair it. There were times when it definitely wasn’t easy for her to adjust to being back but she never let it show. Her wavering on whether she should speak up or keep her secret was realistic no matter how badly I wanted to scream at her to do the right thing. It was going to be a hard decision she would have to live with no matter what she chose and the author did a great job portraying that. Other than Kayla, I found it hard to get a grasp on the other characters. There was so much there that could have been explored and developed but was left alone. The book was very short, under 300 pages, so maybe there wasn’t the time, but I think I would have connected more with them if there had been more to them. At times, the book was a little too realistic. In a good way. Kayla was a regular girl, not someone looking to be a hero, and she struggled with what she knew was the right thing to do vs what was the easy thing to do. What happened that night of the party does happen and people do stay quiet about it, and it was impossible(rightly so) to forget that while reading this book. Confusing time jumps but good mystery. It was pretty confusing with the time line jumping back and forth. I never really got a sense of how everyone related for awhile into the story because there was a group of four friends in the before. and that is always harder for me to to get a handle on the dynamics and the different personalities even without the jumps in time where all of the alliances change and so many people were calling the main character Kayla a killer when the reader is left not knowing the details. But I wanted to know what happened and connect with Kayla even though it took longer than I wanted for that to happen I finally realized how it all connected and I understood why she was so scared and why she acted the way she did. I was glad she finally had the courage to do the right thing. There was a nice little romance in this one. I liked that it never took eve front seat tho the bigger issues but targeted reinforced Kayla and the strengths she had but didn't realize. I wish that stories like this didn't happen in real life but hope that this can make some one brave with to speak up either for themselves or for someone else. Bottom Line: Confusing time jumps but good mystery.